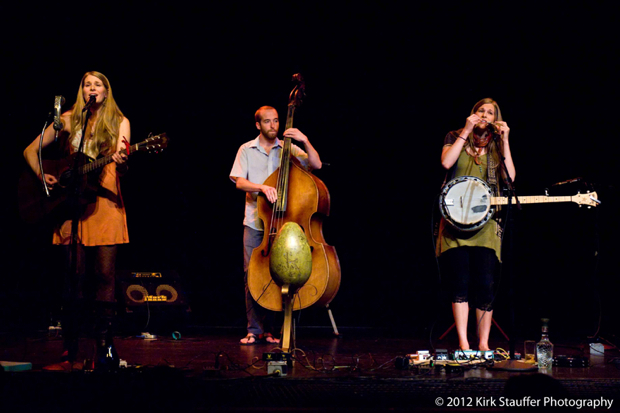 To use a word that the twins themselves fancy, the Shook Twins are delightful women who play delightful music. 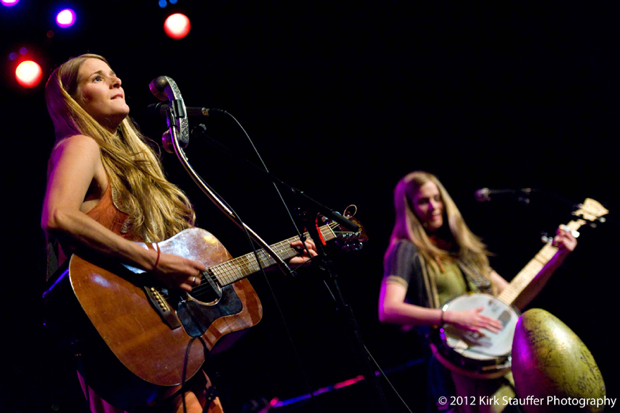 Katelyn and Laurie Shook of the Northwest duo the Shook Twins are, quite literally, identical twins. 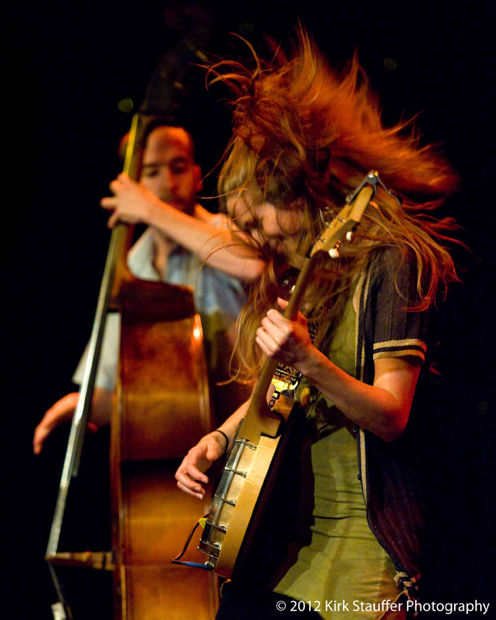 They are joined on stage at Seattle’s The Triple Door by their bassist, Kyle Volkman. With alike voices, Katelyn is the acoustic guitar playing soprano who exalts into a near operatic, classical voice at the end of their set. 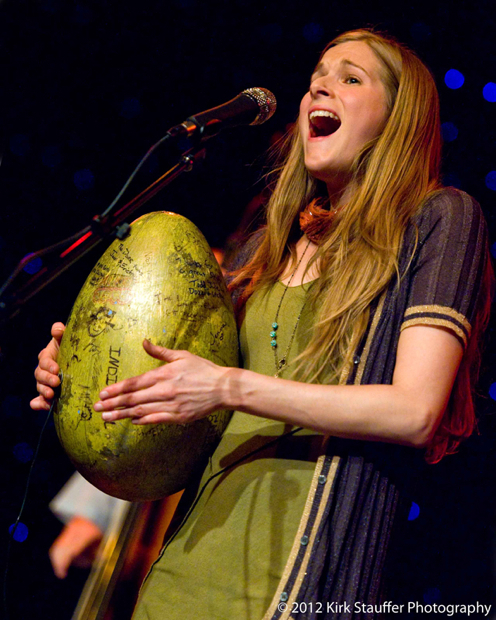 Laurie is the banjo playing, giant egg-shaking alto of the group who is known to beatbox. They make folk music but I would not be surprised if they progressed into trip-hop. From the first song, their performance was lovely, full, lush, layered, and beautiful with frisson inducing bridges–and the girls were funny. As their set progressed, the twins began to loop instruments and use more effects. Their songs began to surprise you, like when Laurie started laughing into the telephone mic she had been singing into and you couldn’t tell if it was a deliberate part of the song, but it fit much too perfectly not to be. How did the Shook Twins come to be? Katelyn: Laurie and I started playing regularly after we graduated college in 2006. At first it was just the two of us playing pretty lame covers and very cheesy originals. Then we met Kyle in 2007 as well as a cellist and a drummer. We made our first album You Can Have the Rest with them and toured as a band for a little over a year. Then we moved to Portland and started all over again and grew a lot with our music. What’s changed for you in the past year? Katelyn: We started working with a manager, booking agency and a publicist. We met more musicians that are joining us on stage more and we’re feeling a huge shift in quality. The venues have gotten bigger and better and our sound is really starting to take shape. Having more people on our team makes a HUGE difference. How has the dynamic changed since Kyle re-joined the band? Katelyn: He’s definitely the back bone of our music. We can always feel a big hole when he’s not playing with us. It’s been very comforting to be able to stand up real straight and tall with him behind us. What are the musical and personality differences in the group? Katelyn: I’d say that I am the main writer so I feel myself having the role of conducting the songs that I write. Laurie is the techy twin, meaning she runs our sound a lot, or makes sure the sound engineer at the gig is doing their job. She does all the looping and textural elements that add to our sound. She also edits little videos and mixes live recordings. Kyle is a very fast learner and doesn’t need to practice much at all. He is also the best driver of all the land and gets us to our destinations very safely. Do you find yourself writing more formally or more casually the longer you are in the music business? Katelyn: A little bit of both. They seem to be coming out easier and more casually, but we take more of a formal approach to crafting each song once they’ve fallen out. After working with such brilliant artists, we are learning to be more specific and deliberate with our own songs. I see that you both have a film and media background. Do you want to combine that with music one day? By making music videos, or composing a film, or some other synthesis? Katelyn: Laurie is using those editing skills we learned in college on our home-made dorky music videos. We’ve always thought it would be cool to have a big part in making a big budget legit music video. Having that degree really did give us a good eye and high standards for video and audio. Do you both gravitate toward different elements of music? 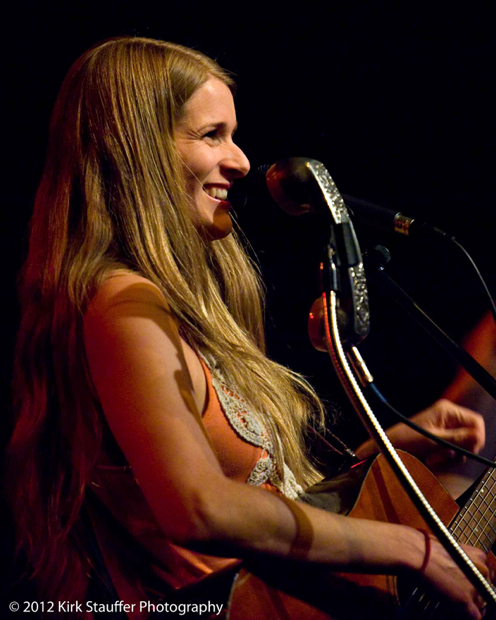 Laurie: Katelyn gravitates toward the lyrics and melody. They come out of her more naturally. I gravitate toward the rhythm, harmony and form of the song. You’ve mentioned before that some people make fun of you for writing happy songs. Why do you think it’s so easy for some to hate on people who are perpetually outwardly happy or people who create art, like yourselves, that embraces happy feelings? Laurie: Because most are not outwardly happy and don’t understand it. Even we are too busy hatin’ to create art sometimes. The more life that happens to you, the more challenging constant happiness becomes. But music sure balances it all out for us. Is it important to you to keep things quirky and lively in your music throughout your musical life? Laurie: We always want to keep mixing it up and trying new things. It’s always better when the music is alive. Plus, we don’t really want to take ourselves too seriously. That would get stressful and boring. What do you want to experiment with more in the future? Laurie: Perhaps, electronic elements. Maybe going from folk to ambient electronic at the end of a song. Our producer remixed our song “Time to Swim” and we really like the idea of that. What do you absolutely need people to know about you? Laurie: That we both have curled pinkies which is why we can’t play a decent bar chord. Anything you never get asked that you wish people asked? Laurie: Katelyn was born first, one minute before me. Photos by Kirk Stauffer Photography. Preview: Seattle SoundBYTES Presents Jack Sparrow, A Musical Gary Clark Jr. giveaway!